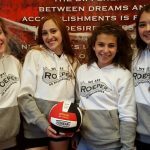 Roeper Varsity Volleyball begins District play Wednesday, November 1st at Everest Collegiate Academy in Clarkston at 7 pm. Volleyball Districts 17 GO ROUGHRIDERS! The Roeper Spirit Shop will be open during Spooky Volleyball on Friday, October 27, 2017 from 4 to 7 pm in the CCB. Don’t let the cold “creep” up on you before getting your winter essentials, like scarfs and cozy sweatshirts!